So, now that I am back, I can post some photos of my last three days of painting with Ryan Wurmser and a few new friends. Each day Ryan started with his demo as we watched, learned and took notes… mental or otherwise. Then after lunch we would be off on our own to apply what we gleaned. 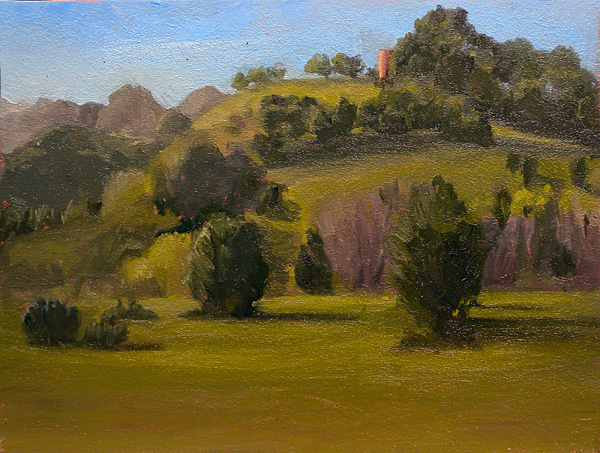 Our first day was Malibu Creek State Park. Beautiful and sunny. 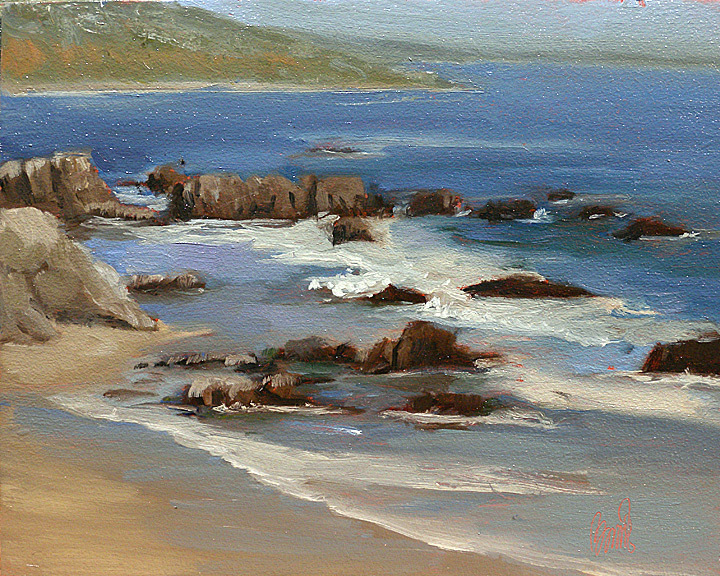 Secondly we went to my favorite beach to paint at, Leo Carrillo. There is PLENTY to paint. The same scene changes so quickly throughout the day. To watch the changes in the water is fascinating. Then the third day we were off to Peter Strauss Ranch. Each location had its challenges to overcome. Wonderful light that moved across the sky on one day turned into a sun that played peek-a-boo behind the clouds another. I have never posted any location photos, but I do so here to share some things. First, look at the photos of the knoll in the first set. Notice how much the light has changed in the three hours from the beginning and end of my painting time. Its impossible to paint so quickly in such a complicated scene. So, you must pick out parts to highlight and hold on to the values in your head… which I had a problem with. For me, the take-away to this weekend was a stronger sense of composition. 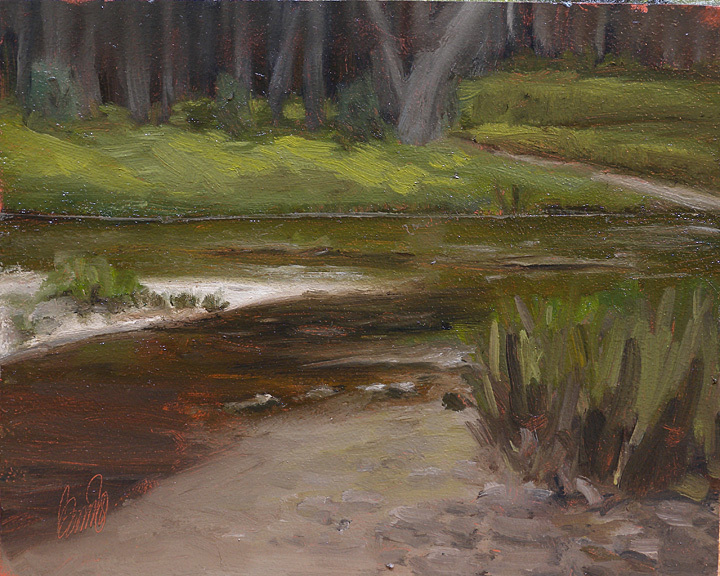 Ryan showed us many sketches of various compositional possibilities in the same scene. He would ask “What’s the story here” and then show how each sketch had something different to say about the scene. Good work Ryan!! So, here are my sketches. “I Love My Job” – This is what you were created for. To enjoy the beauty of God’s creation and reflect its majesty to those whose eyes are not quite as wide open as yours. Your worship reflected to the masses. Love your work in all mediums…including the writing. May your journey continue to unfold with great expectation that the best is yet to come. Enjoy the journey!